We at Travel Adventures Botswana enjoy making your self drive safari as stress free as possible. For this reason we offer our services arranging and pre-booking all your accommodation and camp sites for the duration of your self drive. Of course for some, part of the self drive safari experience is doing everything for yourself, even the booking of accommodation, and having the freedom to choose as you go. In either instance it helps to be able to easily access the campsite options and costs so you can compare, decide and budget accordingly. We have compiled a list of our recommended Campsite Options, costs and Contacts for your convenience. You can download our Campsite Options & Costs PDF here to view the current rates available. In the event that a client is booked into either of these campsites please be aware of these guidelines: distances are not guideline to driving times! Mwandi View is situated near the village of Mabele 72km from Kasane on the Ngoma side of Chobe National Park. The site overlooks the huge floodplains towards Caprivi Strip. Chobe National Park boundary is on the eastern side of Mwandi View and although not situated within a National Park, a fair number of game will come out of the park to drink water near Mwandi View. The area has a considerable amount of elephant activity. Game Drives should be done on the Chobe River Front area of Chobe National Park – a distance of 21 km on a tar road. We would recommend doing day trips into the park returning late pm to Mwandi View. The western (Ngoma) side of the park has much less traffic than the Kasane side. If a Savuti campsite is unavailable it is much shorter to drive to Khwai (Dijara /Khwai Community) from Mwandi View than from Kasane (you would save about 2 hours driving time). We would recommend driving back to Kasane to refuel before heading to Savuti / Khwai. Mwandi View has lovely green grass campsites as well as chalets and a restaurant. The camp is privately owned and managed. Mwandi View to Dijara via Savuti is a distance of can be driven in a day. Khwai Community campsites are an additional 45 min drive from Dijara and Khwai North gate and additional 45 minutes drive again. We therefore we recommend Dijara as it reduces the driving time. Use it as a one night stop en-route to Moremi or stay at Dijara for 2-3 nights. 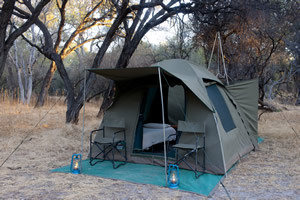 Dijara is situated in a wildlife management area between Chobe National Park and Moremi Game Reserve. It has a high concentration of game although the game drive routes are limited. The campsites are private and have basic shower and flushing toilet facilities. Each campsite has its own toilet and shower. The campsite is community owned and managed. To optimise game viewing while staying at Dijara we would recommend doing day trips through the Khwai Community area (30 -45 minutes drive away) and if need be Khwai North Gate area which will be approx 1 hour 20 minutes drive away on a road that has a fair amount of game. This year the wild dogs had a den site 50 m from this road. Not restricted to park opening and closing times. The area is popular with mobile safari companies and self drives alike. The area has excellent game viewing and at times much better than inside Moremi. There are no facilities in these campsites and one must be completely self sufficient with portable toilets and showers (supplied by Travel Adventures on request).